I’ve just returned from the Tucson Festival of Books 2018 and I’m a combination of exhausted and euphoric. What an awesome event! In case you’ve never heard of it, the Tucson Festival of Books is held on The University of Arizona® campus. It celebrates southwestern U.S. books and authors (for the most part, there are many exceptions) with panel discussions, workshops, and book signings. It is a wonderful place to discover new favorite authors, as well as to glean tidbits about the craft of writing. The festival organization and the venue are fantastic. plus it is free to attend. The only down side is that here are so many things to see and do, it is impossible to cover it all. A few authors stood out among the over 500 attending. His newest novel, High White Sun, is coming out next week. It is a sequel to The Far Empty (previous review). J. Todd Scott is currently working as an Assistant Special Agent in Charge for the DEA, but also manages to find the time to write exceptional novels set in west Texas. It’s like driving a car at night. You never see further than your headlights, but you can make the whole trip that way. It was good to see Todd Scott invited to speak on a panel. Most of the panels featured writers who were hawking their 6th or 12th or even 57th book. He’s already being taken seriously after one novel. She discussed her newest, Keep Her Safe: A Novel. Why is a British author at a southwestern book festival? Because Keep Her Safe takes place at a luxury resort in Arizona. The story came from a real life incident where the hotel receptionist gave her the key to a room that had already been given to someone else. She was tired and disoriented when she entered, so didn’t realize the hotel receptionist’s mistake until the room’s occupant confronted her. That is creepy enough, but afterwards she began to imagine what if she had seen something that she wasn’t supposed to see. She incorporated that idea into the book. Sophie Hannah’s writing schedule is the best I’ve ever heard. For her latest novel, she wakes up around 8:30 a.m. Without getting out of bed, her husband brings her tea, a chocolate croissant, and her laptop, which she uses to write for three hours. Then she gets up and starts her day. My jaw has permanently dropped after hearing that. It is the anti-matter version of my life. Her debut novel is Blood’s Echo (A Veranda Cruz Mystery). Isabella Maldonado (Judy Jance called her “Bella”) is another up and coming author. In her workshop, Writing Authentic Police Procedurals, Maldonado used examples from her experiences with the police force to illustrate how to write an authentic crime-based novel. Tidbits included that it is illegal for a police detective to talk about his or her case with someone outside the investigation, and that if a police officer is involved in a fatal shooting, he or she is “sidelined” for at least a month while under investigation. She then suggested ways to circumvent the rules, or at least show you as an author understand them. She also explained big city police forces often have layers of bureaucracy that are too complex to be portrayed realistically without potential confusion and a huge cast of characters. Again, she suggested ways to condense the bureaucracy while making it seem real. With her extensive insider knowledge, I think she should write a nonfiction book on this topic. In addition to all the great information about writing, it was also possible to make some generalizations about the readers who made up the audiences at the Tucson Festival of Books. First of all, baby boomers love mystery, suspense, and crime. Whenever the panels where made up of mystery authors, the audience in the room skewed noticeably to the baby boomer generation. Based on what I heard from those sitting around me, plus the speakers, it seemed like a lot of the readers were initially influenced by Agatha Christie and Raymond Chandler. For example, Craig Johnson referred to an Agatha Christie book in his Longmire novel about a crime on a train. Sophie Hannah has been commissioned to write new novels featuring Agatha Christie’s Hercule Poirot. Where were the younger readers and writers? They showed up for science fiction/speculative fiction/fantasy authors, as well as those who specialized in young adult. The early influences of these choices were less concrete, but I heard numerous references to Harry Potter books (one young author “sorted” her characters by which house they would belong to in Hogwarts), Hunger Games, and to a lesser extent, Game of Thrones. It was not completely clear whether reading the books made the genres more popular, or the books were popular because the genres are. 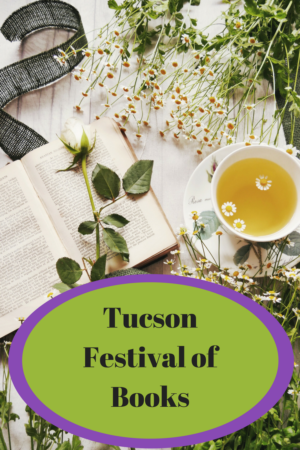 In any case, the Tucson Festival of Books has a lot to offer for writer and reader alike. If you love books, you might want to put it on your calendar for March 2019.